We continue our overview of Hasidic mystical food customs. The number twelve has been a potent figure in Judaism since Biblical times. There were, of course, the twelve tribes of Israel (thirteen, in fact, but we kept it twelve symbolically by defining two - Ephraim and Menassah - as "half-tribes." The very need to force the tribes into a procrustean 12 is indicative of its importance). It was also the custom to have 12 loaves of lechem ha-panim, "bread of display," "bread of presence," or in that quaint King James idiom, "shew bread" (Leviticus 24:5-9). These were displayed for a week in the sanctuary on a gold table and then given to the priests to eat (yum - B.T. Gittin 60a). With the end of the Temple service, as part of transforming the Jewish home a mikdash me'at, a small altar, Jews would have bread for Shabbat and festivals on their tables, usually two loaves of challah (bread with a token dedicatory offering removed from the dough before cooking), signifying something different, the lechem mishnah (the two portions of manna) received by the Israelites for Shabbat (Ex. 16:22). But hang out at a Hasidic shabbat, and you will often see not two, but twelve loaves (Mishmeret Shalom 28e). That's a lot of challah. The custom is drawn not directly from the Bible, but from the pre-Hasidic teachings of Isaac Luria, who insisted 12 should be obligatory. He noted that the in the Zoharic phrase, "This is the table that is before God," the word zeh ("this") equals 12 in gematria - rendering it "12 is the table that is before God" (Pinchas p. 245). Twelve loaves ensured that God would be present at that gathering. These needed to be arrayed 6 on one side of the table, six on the other, just as the lechem panim were. The Hasidic work Sha'arei Teshuvah proposes a different arrangement: four stacked double-decker on the right, left, and center (274a). 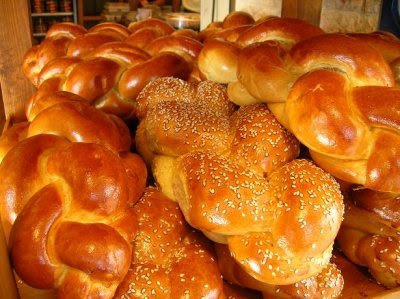 Some Hasidim don't actually serve 12 loaves, but will bake large challot made of twelves parts (either braids or just twelve different dough samples) known as yudbeisnik. Hellboy II: A More Jewish Demon Prince?